We have been hearing about Samsung gearing up to bring Samsung Pay in India. Samsung Pay was first teased in India in late January after it pushed the Nougat update to the Galaxy S7 and S7 edge. 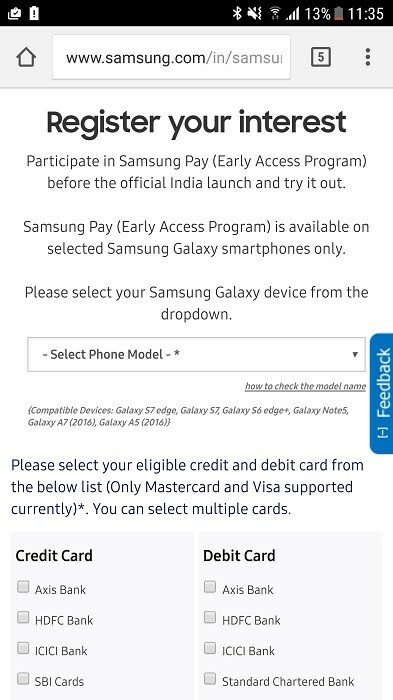 Well, it seems that this payment system might be debuting in India soon as Samsung has now opened up registrations for the Samsung Pay early access program in India. Samsung has opened up registrations for the Samsung Pay early access program in India, and, if you are interested in getting early access to Samsung Pay, you can head on to www.samsung.com/in/samsung-pay and register yourself. However, do keep in mind that the list of compatible devices is pretty small for now. The devices which are compatible with Samsung Pay right now are Galaxy S7 edge, Galaxy S7, Galaxy S6 edge+, Galaxy Note5, Galaxy A7 (2016) and Galaxy A5 (2016). Besides, the number of banks supported by Samsung Pay right now are Axis Bank, HDFC Bank, ICICI Bank, Standard Chartered Bank and SBI. Citi Bank is said to be added to the list soon. Also, there have been reports of Samsung Pay website having issues with the Google Chrome browser. If you too are facing issues with the registrations while using the Google Chrome browser, we suggest you try it again with some other browser like the Mozilla Firefox. As of now, there’s no information from Samsung regarding when the registered users will actually get early access to Samsung Pay. If you have any of the above mentioned smartphones and credit/debit cards, you will be able to use Samsung Pay for making payments using your smartphone once it’s official in India.